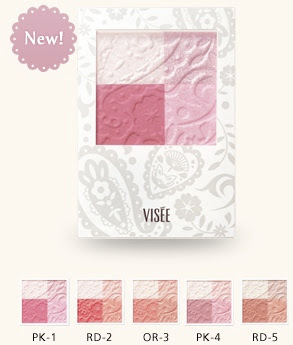 The Visee website has been updated with its new mineral makeup collection. The five new Mineral Cheeks (Baby Finish) blushes look promising. These are formulated with a mild mineral powder coated with emollients, a soft mineral powder to give a baby-like finish and a bright mineral powder to counteract skin dullness. Hopefully, Lotus Palace will review these soon! If you are interested in purchasing Visee, Adambeauty.com is a reliable online store based in Hong Kong that ships internationally and has reasonable prices.